The mastermind behind the unstoppable ramen burger reflects on the food craze he created, and looks forward to his next challenge at the forthcoming Ramen.Co. Just a year ago, the juxtaposition of the words ramen and burger in a sentence would have sounded like a bad joke to most Americans. That changed last summer, when Keizo Shimamoto introduced New Yorkers to the ramen burger, a Japanese novelty re-engineered with stateside sensibilities. Coming hot on the heels of Dominique Ansel’s hybrid hit, the Cronut, Shimamoto’s Instagram-ready creation caught the food-world zeitgeist from day one, debuting at Smorgasburg—Brooklyn’s weekly outdoor food festival—to Space Mountain-like lines and breathless media coverage. But like most overnight success stories, Shimamoto put in years of work to position himself for the big moment. As a Japanese-American, Shimamoto spent a childhood shuttling between Tokyo and his native Los Angeles. He became enthralled with ramen and used his dual citizenship to study the craft in Japan, where he worked for Ivan Orkin and the mini ramen chain Bassanova while documenting his love affair with noodles on his blog, GO RAMEN! After uprooting his life and moving to New York to open a branch of Bassanova, his relationship with the restaurant quickly fizzled and Shimamoto found himself searching for a creative outlet. Through an old connection at Sun Noodle, he and his partner, Kristoffer Brearton, were offered use of the Sun stand at Smorgasburg, and with a mere two weeks turnaround, they launched a sensation. 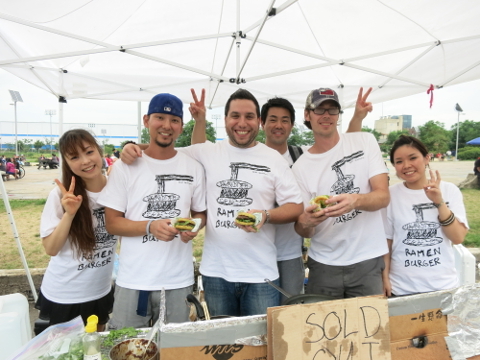 From there, it’s been non-stop insanity for Shimamoto and his ramen burger, which has been featured on Good Morning America and taken on tour to Brazil, Hawaii, and L.A., where Shimamoto received a hero’s welcome from his hometown crowd. So what’s it like to be at the epicenter of one of the most hyped food trends of the year? Recently, I sat down with Shimamoto to talk about his surreal experience as the face of a food craze, as well as his plans for his new Financial District restaurant, Ramen.Co. Let’s talk about the process of getting ramen burger off the ground. Did you already have a relationship with Sun Noodle? It was more like a friendship. I’ve known them for a while, since before I came to New York. About 7 or 8 years ago, I went to this food show in L.A. and met the owner, Mr. Uki. He took my card for my GO RAMEN! blog and gave it to his son, who was a follower of the blog, and we started exchanging emails. When I went out to Japan to train, they actually came to visit me. They came to Bossanova to eat, and that’s when the friendship really started. Then, when I came to New York and [stopped working with Bossanova] I needed something else to do, so they said, “We have a booth at Smorgasburg; we’re not there every weekend, if you want take the booth and do what you want.” That’s kind of how ramen burger started. How do you think American audiences have understood—or misunderstood—the ramen burger compared to how it’s viewed in Japan? Well, my ramen burger is different then the one in Japan. The one they have in Japan, with the chashu [pork belly] is sort of different animal than what I created. When the Japanese media got a hold of what I was doing here in Brooklyn, I actually went there to be on a TV show—one of the networks flew me in, and the reaction there was pretty amazing. It was beyond what everyone knew of the ramen burger that was in Japan. Explain the differences besides the meat. For starters, your bun has more structural integrity than the Japanese version, correct? A lot of the places have a mold and they fry it on top of a flat-top and it comes out as a messy noodle tangle, and then the “burger” is the chashu you’d find in a bowl of ramen. 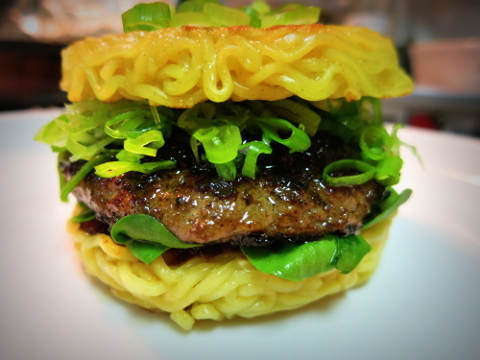 Are there shops in Japan that specialize in the ramen burger? It’s not really that common. It’s more of a street-food thing. It’s usually like a stall at a nearby temple that’s doing a festival. The very first ramen burger I made was based on a double-double from In-N-Out. So your main idea was to take that concept and apply it to a more American style of burger? Being Japanese-American, and growing up in L.A. loving ramen and burgers, the first thing I thought of was, “If this was a beef patty, it would be a real burger, and it’d be awesome.” So that was always in the back of my head coming to New York. I didn’t come to New York to make the ramen burger, but it was something I fell back on. Was there a particular burger in L.A. that influenced your construction of the ramen burger? So you took In-N-Out as a model, then incorporated Japanese elements? In-N-Out was just the first one, as a model, because I grew up eating it. I tried to make a special sauce, but that first burger wasn’t very Japanese and I wanted it to represent my ramen background as well, so that’s why I created the shoyu sauce. What things have you tweaked since ramen burger started as this weekend food stall? How has ramen burger evolved as a business? It’s only evolved because we’ve been forced to evolve. We’ve been so busy, there hasn’t been much time to plan out every single detail of how we want to grow our business. It’s kind of just grown naturally because it went viral so quickly and we were pushed to sell all these burgers every weekend. We know you’ll be at Berg’n, the Smorgasburg food hall in Crown Heights, but are there any other plans to expand ramen burger as a franchise? Well, we actually had really strong response to it in Hawaii, and we’re talking about opening a Ramen Burger shop there. This guy who has an unused space at the moment is really interested, so it’s looking like that’s next. In terms of Ramen.Co, what’s been your experience transitioning from a nomadic operation like the burger stand, to a stationary brick-and-mortar? It feels good to be concentrated in one space, cooking ramen every day again. That’s always been the plan. To work in ramen. My first passion was always ramen. The ramen burger was kind of this freak accident that has supported my life this last year. It feels good to be getting back to my love for ramen. Walk us through the concept for the restaurant. What are your goals? In Japan, you go to a ramen shop, big or small, you go in, you get your ramen fast, you eat it. Ten, fifteen minutes, and you’re out the door. That’s the general flow. You don’t sit around, you don’t have drinks, you don’t talk to people—it’s in and out. Fast food, in a sense, but really good food. So what I’ve seen in New York, having been here a year now, ramen is really becoming a dine-in, sit-down experience. You have a few drinks, appetizers, you eat a ramen. I thought this whole fast-service model would be perfect to educate Americans how ramen is really supposed to be eaten. You put your order in on a machine and get your ramen quickly. It’s more authentic to the Japanese experience, and what better place to do it than the Financial District where you have all these businessmen and women? When you go for ramen for lunch in Japan it’s guys in suits, by themselves eating quickly. I thought a whole fast-service model would be perfect to educate Americans how ramen is really supposed to be eaten. Do you have any anxiety moving past the ramen burger and opening yourself up to criticism as you show what else you can do as a chef? Of course. There’s always anxiety involved in anything anyone does when you’re trying to be successful. There’s a lot of pressure. I quit my job and went to study in Japan for a long time. I’ve eaten ramen all over the world and I’ve complained about it on my blog and criticized other people, and now I’m opening myself up to the same. But it’s a welcome challenge. I’m not trying to do it to be extremely successful, I just want to make something good. All this media attention that I’ve gotten in the past year, it’s great, but I really want to just make good food, good ramen—something I can eat and something I can teach to others so they can make the quality of ramen better throughout the world.